An aerostat may be used for aerial photography, advertising, cargo transportation and simply for beauty. Approximately, one cubic meter of volume corresponds to one kilogram of the cargo lifted. The price of one cubic meter of helium for balloons is between 10 and 100 euro dependently on the supplier and the quantity (in the year 2009). Often, a mix of helium and air is sold instead of pure helium. Hydrogen is much cheaper; in addition, it may be produced upon field conditions. Why hydrogen is considered dangerous? If hydrogen is mixed with oxygen in proportion 2:1, an explosive gas is obtained. A concentration is considered dangerous, if the volumetric share of air in the mix exceeds 25% (or 4%, if pure oxygen is used). 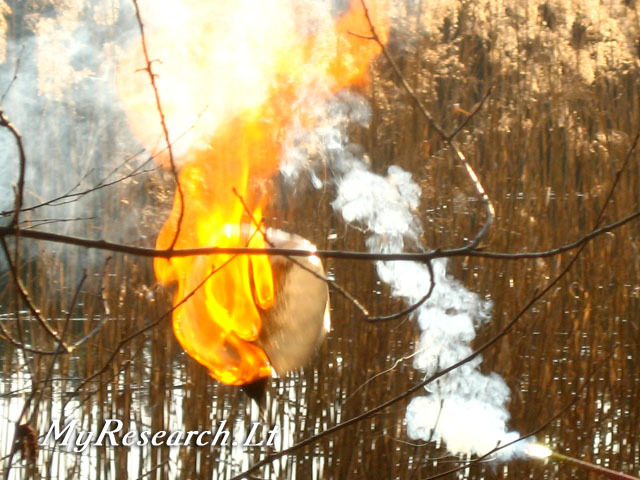 Pure hydrogen burns out without an explosion. The above-described attests that an aerostat with hydrogen should not be used in closed premises; it should not be lifted and landed near crowds of people or an open fire as well. One more danger is a statutory ban. In the realty, firing of an aerostat is not so simple. During the World War One, England was forced to invent special firing bullets, because ordinary bullets did not cause a considerable damage to German dirigibles with hydrogen while hitting them. So, a freely flying away balloon with hydrogen is not more dangerous than Heavenly lanterns with a burning candle. There are many methods of hydrogen producing; hereinafter, I’ll describe one of them tested by me. The presented photos show a 40-liter packet to be filled. In aerostats, a rigid carcass with a soft coating is usually used and special packets are filled with hydrogen in an internal section of such aerostat. In the upper part of the aerostat, a hole for elimination of the hydrogen having left the packet (to avoid a concentration of the explosive mix inside) should be provided. 9. Hermetic waste bags with the total volume of 200 liter. The flask with the plug will be used for the reaction. The bowl will be filled with the ordinary water and used for cooling the plug. In addition, the ordinary water shall be required for washing when a leaked caustic soda must be eliminated. Distilled water can be acquired at a shop for vehicle maintenance. Aluminum shall be any off-cuts of dust-free aluminum profiles. It is desirable to choose the thickness of aluminum walls about 1 mm. 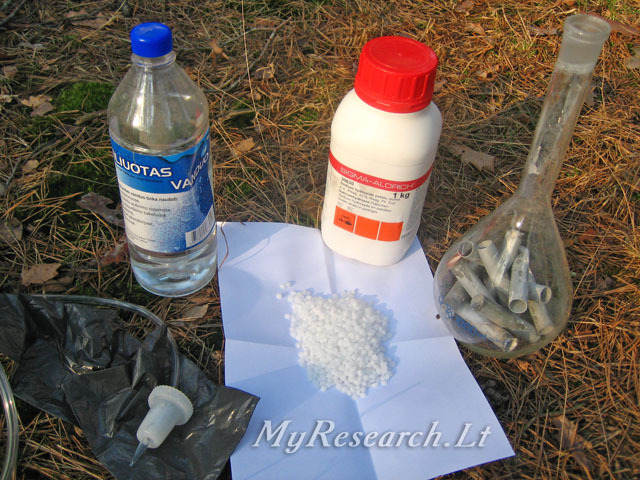 Sodium hydroxide is a caustic soda (lye) usable for cleaning waste pipes; it is also registered as a food additive E524; it can be acquired at a shop where chemical reagents are sold. A high concentration solution of lye irritates skin. Please, use gloves and glasses to avoid accidental splashing of the eyes. 1. Fill the bowl with water for cooling. 2. Insert the loose end of the hose into the waste bag; however, it should remain flattened to avoid its filling with air. Clamp the open end of the packet on the hose with a rope and connect the rope to a heavy thing. 9. 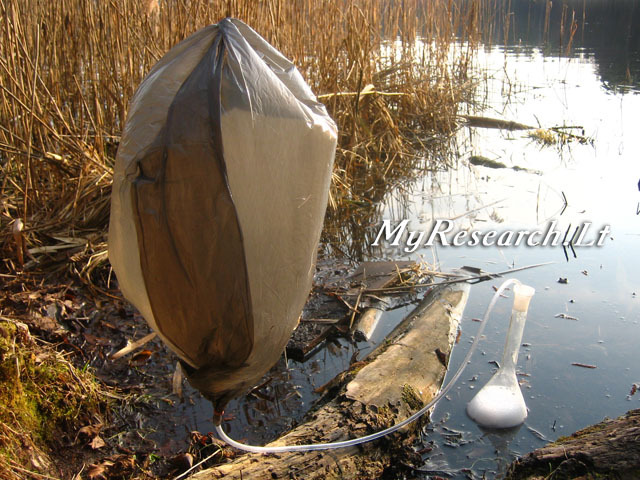 After a certain time, the waste bag filled with hydrogen will dangle in air. You may fill the next bag. The volume of the produced hydrogen amounts to 167 liters (10-20 small balloons). It is desirable to use waste bags instead of balloons, because a waste bag does not expel gas from it. For controlling the speed of the reaction, you may put aluminum into the flask in parts, not the whole quantity at once. 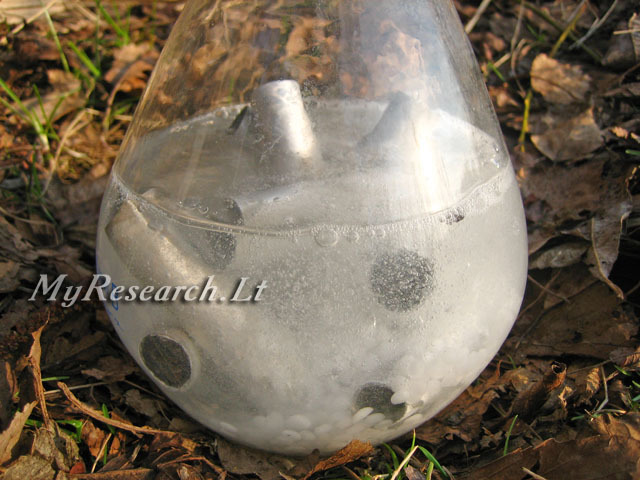 If the flask with reagents overheats, the solution will rapidly boil and the foam with lye will splash out. If the temperature of the flask is rapidly increasing, its contents should be immediately outpoured. Such a quantity of lye will not cause environmental damage; however, it will damage the surface of things where it gets on. Thoroughly eliminate it with water. The contents of the flask may be poured into the bowl with cooling water: this action will immediately reduce the speed of the reaction. If you know the proportion between the lifting force and weight, you can calculate the altitude of flying of the aerostat with your cargo. Distances of flying of the aerostat in the direction of wind can be considerable. If you add engines and a navigator, you may program an approximate point of discharge of the cargo.